...the moment you've been waiting for! The New Year Writing Contest for The Penslayer and Scribbles and Inkstains has come to a close. We had gobs of beautiful entries and we had difficulty picking only one to take the cake and only one to be second-place. “What is it?” Aron covered his eyes with both hands. The image of it still burned in his eyelids, shooting pain through his head. It was delicate, like a butterfly’s wings or a column of smoke, yet in the delicacy lay perfect design and order, which indicated a strange resilience. It appeared to be formed of several strands, each with its own quality, each lending its unique radiance to the whole. Like hair, Aron thought. He dared a glance between his lashes, trembling, and the pain seemed to explode behind his eyes, but he could not look away. In a way, even the pain accentuated its beauty, proving that it was more than a fragile apparition. And its size! It filled his vision, one side licking the dark river that flowed to Aron’s right and the other touching the clear purple mountains in the distance on his left. The entire sky seemed to blaze with its glory and to brush the bottom of the rainclouds with many colors. “What is it?” Aron asked again, clutching his sister’s hand. The delicious ice cream side to our writing contest was this piece by Yaasha, sporting a breath-taking new look at rainbows that was, for Abigail and me, completely unexpected. Thank you, Yaasha! I will never look at a rainbow quite the same way again. It took me a while to figure it out, but now I know. When we first met, you came into our house, to see my father. He was drunk again. You stole his wealth, you stole his reputation, and you stole his kindness, and eventually you stole his life. I didn’t cry, because you had stolen my family’s affection for him, too. You were a strange looking man, very old and yet very young, dressed in garb from about every era and every culture that there has ever been. 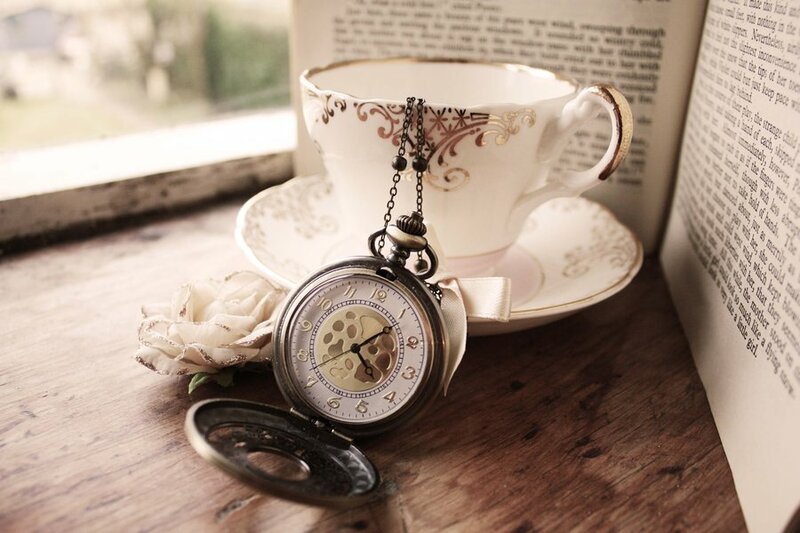 I counted at least ten pocket watches and thirteen wrist watches, so I could hear a distinct ticking sound whenever I went near you. You turned to leave, but you said you would be back one day, and that we’d better be careful about what we allow you to take. I asked what your name was. “In time, you will come to know it,” you said. Those words puzzled me at first, but now I know your name was hidden in your words all the while. I know who you are. You are Time. And I’ll be ready for the next time you come to call. This one took the cake and made off to Wonderland with it. Alex's piece is both fascinating and eerie, and one of the rare occasions Abigail and I have seen second-person employed so poignantly. Chilling, Alex, very chilling, and also beautifully defiant. We enjoyed this one immensely. Huzzah to you both, girls! Heraldic emails await you both to make sure you get the happy news and remind you of the prizes. And thank you, all who entered. This was a treat for Abigail and myself and we hope to do it again someday. Meanwhile, keep up the scribbling! May your pens never lack for ink nor your imaginations for light. Hi, Jenny! I've been ghosting around your blog for a while, and I enjoy reading your "flights of fancy." I'm very glad that you felt my entry was worthy of a place in your contest! Where I live, rainbows are not uncommon and I have actually seen many double rainbows. I even saw a triple rainbow once (yes, it is possible). Congrats to Alex. I agree with Jenny--it is chilling and dark and eerie. And gripping! Thanks for hosting this contest! It's been fun! That is such a clever way to depict time: clothes from every era, thirteen wrist watches. What an indelible idea. Congratulations girls! Your entries were beautiful. And thanks to Jenny and Abigail for hosting this contest!